One sunny day two weekends ago I went on a meandering cycling trip through Oranmore and Renvyle past the castles and inlets of Galway Bay. My thought was to steer towards the oyster festival in Clarenbridge: I had been drawn there by the poem’s imperative to action, my way of marking the death of Seamus Heaney. As I arrived the festival itself, a tented disappointment of blaring music, had barely begun: the high heels and black ties, attracted by the unseasonal sun, still lingered outside the pub. It was here in Clarenbridge, however, that I happened upon two landscape prints sunning themselves outside an antiques shop. Even from a distance they appeared elegantly conceived; looking closer it was obvious they were beautifully, exquisitely drawn. Both were signed in the corner DEL ET LITH EDWARD LEAR. Now while Edward Lear is really best known as a Victorian writer of nonsense verse and limericks, this reminded me that he was a proper artist too, and most people can recall that his verses are illustrated with whimsical little drawings. 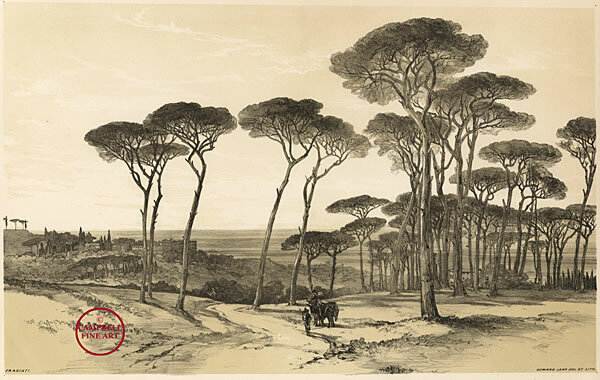 The prints were views of Italy, drawn from the hilly countryside surrounding Rome, with those distinctive Italian stone pines familiar from Turner’s paintings like ‘The Golden Bough’, the young Yeats’s favourite picture in the National Gallery, London. Their heavy heads and the softly shaded buildings perfectly captured the end of summer – while the details of the foreground foliage and the delicacy of the draftmanship convinced me that the artist must have had proper botanical training, this being the era of that sort of thing: remembering Darwin’s sketches, and Ruskin’s naturalist imperatives. Moreover, the fact that this was not a second-hand engraving but that the artist had executed the lithograph himself suggested a real dedication to craft, confirmed by the disciplined but easy connection of eye and hand. 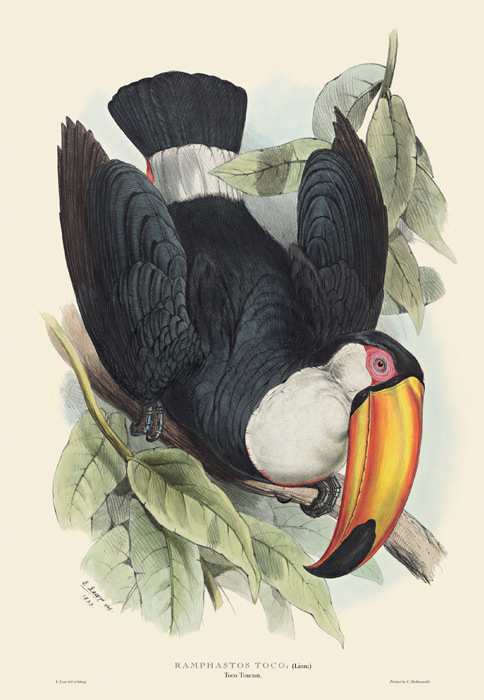 In fact as it turned out Lear was no ordinary artist: he’d worked since he was very young on ornithological drawings and prints until his eyes gave out. 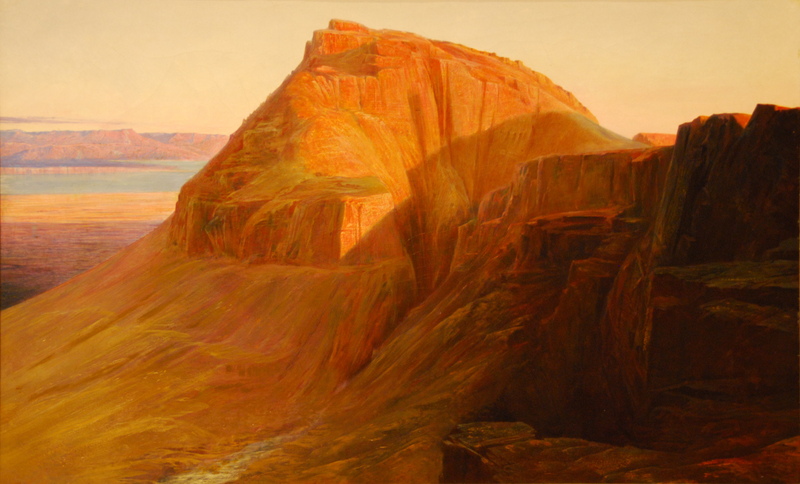 Suffering too from epilepsy and lung disease he had come south, spending much of the rest of his life travelling the Mediterranean and the Near East drawing and painting landscapes with an exquisite range and contrast of colour as well as the bold gradations of tone evident in these lithographs. All the while he was accumulating scraps of nonsense verse, which, slightly to his chagrin, were what made his name when published in London. Perhaps it is the air of melancholy behind their whimsy and exoticism that keeps them nearer to mind than his more painstakingly ‘serious’ art, but he is remembered even now more for nonsense than an evident capacity for sublimity. Remarkably, since coming across them in the 1950s David Attenborough had been building a collection of Lear’s bold early ornithological drawings, recently reprinted by the Folio society in a limited edition. Attenborough describes his enthusiasm for prints like that below here, taking an anthropologist’s wry view of collectors. Last year it seems was also Lear’s 200th birthday, provoking an anniversary Ashmolean exhibition that sadly I missed. So all in all I really should have known him rather better. The more I looked at the his prints, the more I felt I could not leave them behind, even if the paper was significantly foxed by west of Ireland damp, and it was clear my bicycle panniers could not fit them. I enquired and the nice lady at the shop said she’d let them go at EU80 for the pair, which was pretty much a bargain I thought, given that almost anything framed is worth about that much. There were spaces on the wall ready for them in my new flat. I detemined to return and claim them, and ever since when the clouds clear they have been at my French windows bathing in the sun, which helps bleaches out the foxing. Meanwhile in low light the gradated tones of the lithograph really overpower any discolouration, and beyond this they are simply marvellous, in composition, tone, detail, everything. 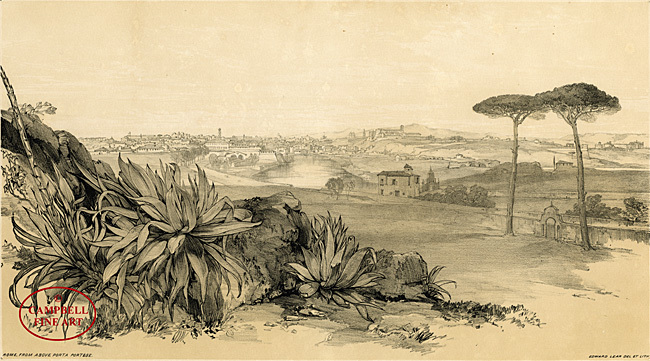 It turned out the prints I acquired were two from this sequence, ‘Rome from above Porta Portese’ (above) and ‘Frascati’ (below), printed for publication in a book, Views of Rome and Its Environs (1841). This probably makes them not very rare, but if in good condition they’d be worth around £300 each so I decided that despite culpable ignorance of the artist my eye was in shape. Interestingly, as well as Lear’s work featuring in many collections like the Asmolean and the National Gallery, here is confimation of the Met’s holding of another of the series – handcoloured but not necessarily by Lear himself, apparently. Anyway, especial thanks to Dan and Sue who helped me pick up the carefully wrapped prints in a car and ferry them home. To celebrate the acquisition we had a fine chowder and crab salad down the road at Moran’s Oyster Cottage, bathing outside in more unseasonal sun. Inside, in the cool of thatch and crockery, it was companionable to imagine Seamus Heaney eating oysters and quickening into ‘verb, pure verb’. After all this was where he conceived ‘Oysters’, a poem he read aloud once more this summer in Galway. In toasting friendship we were also toasting generosity of imagination. In Clarenbridge, Galway, I had found Italy: and all this from a poem which imagines in damp panniers its salty goods returning horseback, ice-bound, to Rome. ~ by thebicyclops on September 29, 2013.